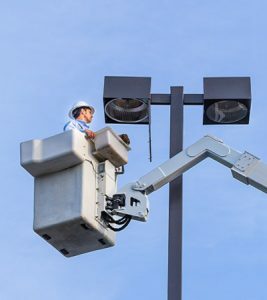 Lighting Services | Southern Lighting Services, Inc.
For more than 22 years, Southern Lighting Services has been a leading provider of commercial lighting services across the Carolinas. 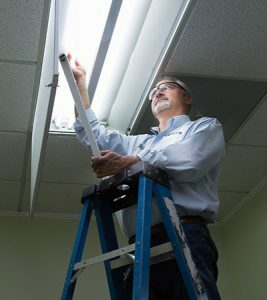 Southern Lighting can repair, install, replace or retrofit any lighting system or component of one. From lamp and ballast replacement to lighting system design and installation, we have you covered. We also offer lighting system analysis, including but not limited to: energy audits, light level readings, and photometric layouts done in-house using our state-of-the-art equipment and software. Southern Lighting Services operates a fleet of state-of-the-art bucket trucks, all of which are fully stocked and driven by our highly qualified electricians. The best way to ensure your lights continue to operate effectively is to sign up for one of our routine maintenance programs. Monthly, bi-monthly, and quarterly visits to inspect and repair dysfunctional lights have proven to be the most cost-effective solution for maintaining your facilities’ lighting. Because our trucks are fully stocked with just about anything we need to make repairs, we are typically able to complete the job on the first visit. For lighting needs that don’t require routine service, Southern Lighting Services’ One-Call Service is as easy as it sounds. You call; we respond. With typical response times of 24-48 hours for common issues, and 24/7 emergency dispatch for those “need you now” moments, you can count on us to be there when you need us. Signs are one of the most recognized parts of any business. They provide advertisement and brand recognition, making it imperative that they are well lit and fully functional. Dysfunctional and broken signs provide a negative image for current and potential customers, while signs that are well designed, fully operational and burning bright are more appealing and draw customers to your business. Southern Lighting Services’ professional lighting design team has years of experience designing effective, energy-saving solutions for both small and large customers. With lighting systems constantly evolving and advancing, Southern Lighting Services is committed to keeping up with the latest lighting products and technologies, ensuring we sell and install the best solution for your application. Southern Lighting can design the perfect lighting solution for you—whether interior or exterior, for functional or purely aesthetic purposes. Emergency lighting and exit signs are used internationally to provide a means of illumination in the event of a power outage. However, most emergency lights and exit signs are powered by a battery or battery back-up ballast, which over time can cease to function properly, leaving you in the dark. Let Southern Lighting Services inspect and audit your emergency lighting to ensure you and your employees can see when the power goes out. Maintaining proper emergency lighting can also reduce your liability for injuries and even lawsuits.